Okean Elzy are probably the most successful and popular rock band in Ukraine's history. They was formed in 1994 in Lviv. The band's vocalist and frontman is Svyatoslav Vakarchuk. The band firmly supported and performed at the Euromaidan-protests in Kyiv last winter. Yesterday, the band performed in Odesa in front of around 50,000 fans - the biggest concert ever seen in the city. The stadium was filled with yellow and blue flags and lights - even more than were seen during the Euromaidan, according to people shouting in the fan zone.. In Kharkiv around 100 generally older folks with red flags protested against the conducting of anti-terrorist actions this Sunday.. In April many if not most residents in the Donbas were in favour of the creation of a possible Donetsk People's Republic. Since then many local businessmen, both large and small in the Donbas region have been systematically subjected to extortion and have frequently been held hostage by Donetsk People's Republic mobsters..According to this report from Censor.net.ua, now all they want is for the Ukrainian army to come as quickly as possible and end the disorder..
A must-see video - Russia, Ukraine and the West: Is Confrontation Inevitable? Russia, Ukraine and the West: Is Confrontation Inevitable? Respected commentator and journalist, Vadym Densysenko, explains the dangers for Ukraine in continuing the current ceasefire. President Poroshenko, following the signing of the Association Agreement document with the EU, is under great pressure both from the EU and from Russia, to 'freeze' the conflict and maintain the current ceasefire. Russia needs time to create state-like institutions, banking, law enforcement agencies, civil servants structures etc. for its Novorossiya project for Eastern Ukraine. Denysenko says that Oleh Tsaryov [photo below] has now been earmarked to lead this project. Unlike the current leader of the so-called Donetsk People's Republic leader Aleksander Boroday, at least Tsaryov can claim to be Ukrainian. He will be totally loyal to the Russian leadership, and will scrupulously follow their instructions. Introduction of Russian/EU monitors will help freeze the conflict further. Opinion in the rest of Ukraine to jettison Donbas region could grow, particularly if 'stimulated' by organised anti-war protests etc. Deterioration in the country's economy could increase these sentiments further. But, Denisenko concludes, right now, Putin need a period of 'peace' to help legitimise Tsaryov, and permit roots of the Novorossiya project to take hold. And the residents in the two easternmost Ukrainian oblasts? What kind of future can they expect in a limbo 'Transdnistria- type' state? Pretty bleak I would guess. A good indicator of the degree of support for the Donetsk People's Republic was provided by the attendance in the central square of Donetsk city today at an anti-Ukrainian meeting addressed by the leaders of the DPR. The fact that political, business and industrial elites of Donbas permitted such a tiny group of rabble that is the DNP to take over their oblast so easily leads to only one conclusion - they were acting at the behest of these elite groups. There are many eyewitness reports of law enforcement officials co-operating or turning turning a blind eye to what was going on. Three policemen stand idly by as an armed man walks/manhandles a handcuffed prisoner in a most professional manner to who knows where [to be held hostage for ransom?]. The armed man has no markings on his military fatigues. The DNP is a stillborn project. Its backers are now only concerned with detachment from this fiasco...hence the pathetic turn-out. The violence from separatists is the work of the Kremlin. Yevgen Іkhelzon, in his Ukr Pravda blog, describes the Donetsk People's Republic as a "stillborn revolution"
"When you walk along the streets of Donetsk, the impression is that everything that is happening there is the handiwork of the local "elites" i.e. the attempt to declare independence was organized by leaders of the Party of Regions who were in close contact with the "family" of former President Yanukovych. Almost all logically thinking locals believe that senior Party of Regions figures such as Nikolai Levchenko, [linked to Rinat Akhmetov] stood at the origins of the DPR. There is even a persistent rumours that the DPR governor Pavel Gubarev is a relative Levchenko's. However, after its birth, something went badly wrong and the situation got out of control for several reasons - money pumped in by Aleksander Yanukovych [to pay troublemakers and create havoc], rapid involvement of Russian officials such as Glazyev and Zhirinovsky; and then the Communists and Russian nationalists piled in. This explosive combination, under the banner of DPR, tried to seize power in the Donbas in a re-run of the "Crimean scenario" - entering local authority buildings, taking control of the region, staging a 'referendum', inviting Russian troops and waiting to take up positions in a new region of Russia. But the situation slipped out of control of local "feudal lords" and industrial chiefs. It has now become clear that Russia will not invade, and the DPR is a fictitious organisation that does not actually control anything. Influence and power still belong to the Akhmetov's people. Local say that the so-called "Vostok" battalion has good relations with Akhmetov, and the mayor Luk'yanchenko is protected by "Oplot." Sentiment among locals is mixed but now that support for the DPR is slipping, citizens do not understand why DPR is needed at all, when the mayor's office still exists. All that remains of the DPR are patrols, semi-deserted road checkpoints and several hundred militants who sit in their bases and occasionally occupy state institution buildings, incurring the wrath of the mayor Luk'yanchenko. It is obvious that the flow of money from Russia has dried up. No-one attends rallies for free, and the idea of regional independence is not as tempting as the idea of raised wages and pensions which were to be provided by Vladimir Putin. Current state of Donbas region. In Donetsk many cafes and businesses are closed; in the evening the city is completely empty and there are far fewer people that usual on the streets during the day. Tens of thousands of people have fled the city, the vast majority did so not because of the ATO, but for the following reasons: intolerable atmosphere in the city, the presence of armed men from which good would come; so better to wait until things calm down. There have never been so many 'For Rent' signs on business premises in Donetsk. I must say that the atmosphere is really quiet, but an air of tension exists. The enthusiasm for the DPR is declining rapidly in the city, I did not notice any St. George ribbons or Russian flags on cars; DPR flags hang only on admin buildings. On public transport, people do not talk about politics, not knowing who shares their own thoughts. In private conversations people criticize the DPR and want everything return back to as it was (there are different opinions, but all are inclined to believe that Kyiv should negotiate and not fight for this to happen). Essentially, almost all Ukrainian institutions are fully functioning and behave just as before the DPR took over. Pensions and social benefits are being paid, and until recently, there has been no interference with the National Bank of Ukraine. Donetsk city council is fully operational, the police patrol the streets together with the DPR soldiers in camouflage and Cossacks, and all are unarmed. Patrols are rare, and are not especially hunting for anyone, police in Ukrainian police uniform attend call-outs and perform their duties normally. It should be noted almost the entire staff of the police and the Security Services of Donetsk did not interfere, but even assisted in the seizure of buildings from which large numbers of weapons were plundered for distribution to the separatist militia. This could not have happened without clear orders of local elites. 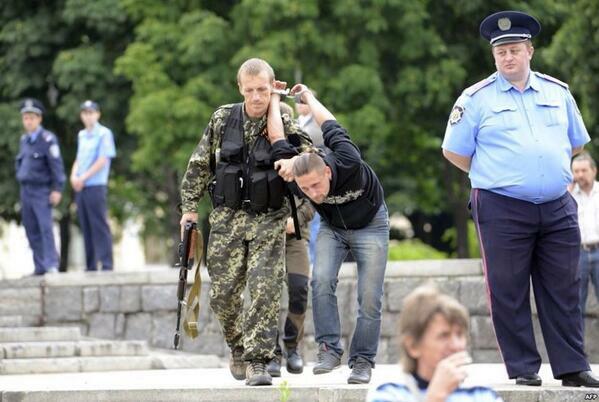 Similarly, the "protesters" were permitted to enter the Oblast Administration building where they remain until now. Police are still working from their usual buildings, and the SBU have reverted to a "home working" mode. Just as with most Donetsk residents, enthusiasm for the DPR is falling in police ranks, providing a hope that in the future Donetsk may return back to the Ukrainian fold. Prospects for the Anti Terrorist Operation. Ukrainian patriots living in Donetsk complain that Ukrainian law enforcers did not conduct any reconnaissance before starting any military action in the city. E.g. when the battle for the airport took place, the Ukrainian army could have easily taken the Oblast Admin building too. Any large-scale combat operations with aircraft and widespread destruction in Donetsk will be highly counterproductive - support for the DPR will only grow as a result. Pinpoint spetsnaz operations with the support of local people can be much more efficient. Even more effective can be negotiations with the real masters of the city where hundreds of thousands of supporters of a unified Ukraine currently live. The DPR cannot exist without two things - Russian propaganda and a Russian invasion. Russian television, which today is watched by almost all the inhabitants of Donetsk, creates a virtual reality. The possibility of a Russian invasion still exists - it could happen if Glazyev, Dugin and Zhirinovsky persuade Putin to do it. Without these two factors Donetsk Republic is doomed and will soon cease to exist. TV and clumsy actions of the troops executing the ATO can prolong the agony, and a possible Russian invasion would dramatically complicate the situation in Ukraine." Several other local bloggers and commentators paint a similar picture. One person who has conducted himself honourably throughout the hybrid war currently taking place in in Eastern Ukraine, looking after the welfare of his city's citizens, is the popular, long-time Mayor of Donetsk, Aleksander Lukyanchenko. "Today there are calls and appeals by many politician and deputies to declare martial law and to roll out full scale hostilities in the Donetsk and Luhansk oblasts. I remind you that these two oblasts contain 42 cities, 36 districts and have a population of about 7 million inhabitants. This is despite the fact that residents are already suffering from the armed conflicts and that they comprise no less 15% of the [country's total] population. The life support structure of these cities and regions is on the verge of a humanitarian disaster. The introduction of martial law, in my opinion, will not improve the situation, but only make it worse. First, it is not clear what forces will be provided to maintain this state [of martial law] on the territory of all these cities and two oblasts. Secondly, with open borders, these measures are practically useless. Third, the military situation will lead to the destruction of the infrastructure of cities and lead to an uncontrolled flow of refugees. I want to appeal to the President of our country, the Government and Parliament to start immediate full-scale talks at the highest level on the territory of our two oblasts to resolve the conflict with the involvement of our northern neighbour - Russia, and international organizations. With their intermediation it is essential to stop this fratricidal war, to prevent the deaths of civilians, children and the elderly. While there is at least one chance to stop the war, it should be used." IMO It is vital that the properly elected ruling authorities in the two Easternmost oblasts be fully engaged in negotiations if there is to be any chance of the conflict being resolved. President Poroshenko must make this clear right away. Wroclaw Global Form 2014 - Plenary Panel 4 — Building a New Ukraine: A Pillar of European Security? "...it's important to bear in mind when you talk about separatism in the east [of Ukraine], we're talking about activity in two eastern regions, out of six. And if you look at the eastern and southern parts of Ukraine, which are predominantly Russian speaking -- that's nine regions. And in only two, and at that only parts of two, are the separatists pretty firmly in control. So that context has to be borne in mind. The Russians' tactics are rapidly adjusting. When the Russians started this whole enterprise in eastern Ukraine, they expected that the citizen population living there would rise up in their support. And that has not happened. We had hundreds of thousands of people on the street in Kiev [referring to the original protests in December], you have not have that in Donetsk and Luhansk -- the fighters have been supported by at most crowds of hundreds, and at most a few thousands. So they started changing tactics then. And I think the election itself has been a further blow to them. Their preoccupation still is to get Western acquiescence in an overall deal that will federalize Ukraine in such a way that the regions it partially controls will not only have autonomy, but have veto power over the central government itself. That's what they mean by federalization..."
Many of the separatist gunmen are shameless looters and thieves. Locals are getting fed up with them already. The catastrophic effect the current troubles in Ukraine's easternmost oblasts are having on the local economy are described in an interview in 'Segodnya' with Donetsk State University professor, Yuriy Makogon. He explains the economy of Donetsk region is primarily export-oriented with about 70% of production going to markets outside Ukraine. If the Donetsk People's Republic formally declares independence, two-thirds of its export markets could be lost. Even now manufacture of engineering products has fell back by 40% and unemployment in the region over the last 4 months had doubled. Small and medium businesses have been particularly badly hit. Makogon believes the region will lose about 30% of its gross domestic product this year. Even in the event of a most optimistic scenario of speedy resolution to the current conflict it will be 2016 before industrial production climbs back to 2008 levels. The economic outlook it truly bleak.